The Gravity of Moments is a large suspended installation that flutters in the breeze. The work is featured in Sculpture in the Glen, along with 50 local, national and international artists work and includes small indoor and large outdoor sculptures in a variety of media. The exhibition is curated by Penny Philpott and celebrates Glen Street Theatre’s 30th anniversary. It opens 5 September and continues untill 25 October 2015. The ethereal sculpture responds to its theatrical site and bushland gardens. 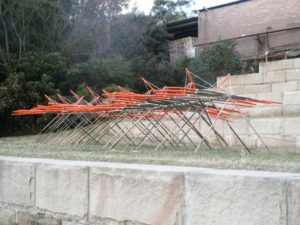 A Thousand Steps is an installation created for the Manly Art Gallery & Museum ‘Keeping Company’ exhibition. New works were made in response to a range of artworks held in the Manly Art Gallery & Museum collection. A broad range of art media was represented including painting, drawing, photography, sculpture, printmaking, textiles and glass. A Thousand Steps responds to Paola Talberts photograph, Kairos (moment of truth), 2000. Kairos (καιρός) is an ancient Greekword meaning the right or opportune moment (the supreme moment). Signifies a time between, a moment of indeterminate time in which something special happens. I was immediately drawn to Paola Talberts work, Kairos. The sensuality of the image with its dreamy, floating figure catching her breath and her rich and moody use of light and transparency all had great appeal. I have responded to the work both materially, through the use of fabric and conceptually, by exploring journeys and transition points. Wings have long been metaphors for our desires to explore, take flight, and soar to new heights. A Thousand Steps marks our day to day hopes and struggles as we journey through life. Bitter Pills is a response to the notion of harmony and dis-harmony. Harmony Pharmacy dispenses conventional pharmacy medicines as well as natural and complementary medicine. It practices an integrative approach to health, including body, mind and spirit. In Bitter Pills nature is transformed and re-configured by the application of various pressures (squashing, twisting, squeezing), and the results encapsulated in plastic pill casings. The work reflects our everyday experiences of stresses and strains, and the sometimes catastrophic results to our fragile health when things get out of balance. On the Way to Ithaca was created for the fifth HIDDEN Rookwood Sculpture Walk held at the Rookwood Cemetery; the largest working cemetery in the southern hemisphere. The exhibition was curated by Cassandra Hard Lawrie. 40 selected artists responded to themes appropriate to the site such as life, love, death, loss, memory and mortality as well as the culture around memorial, eulogy, burial and ceremony. Have Ithaca always in your mind. But don’t in the least hurry the journey. Better it last for years…….. However long our life may be our journey is punctuated by many beginnings and ends. These moments are marked in funerary architecture and memorial landscaping by gates, arches and avenues. On the Way to Ithaca is an ethereal response to these forms as we travel between our first and last breaths; our lives shaped by our ties and connections to one another. The installation aims to explore the tension between life and death, and the fragility of life, as we journey towards Ithaca. On the Edge is an ephemeral kinetic installation exploring balance and counterbalance in the elemental landscape; the ebb and flow of tides, bobbing boats and floating buoys, and the waft of sea breezes. Inspired by the movement of cranes, it responds to the Coal Loader as a site that seeks equilibrium between its industrial heritage, community usage and as a delicate ecosystem on the edge of the harbour.